View cart “Allspice, plant” has been added to your cart. Seed pods of Vanilla plant, Vanilla plantifolia, are the source of the natural “vanilla” flavouring. Used in the preparation of ice-cream, cakes and beverages. The pods are also used in the manufacture of perfume and are exquisite in pot pourri. Cultivation: Sub-tropical or tropical climbing orchid vine that may reach up to 50 ft high. Native to southern Florida, the Caribbean, Mexico, Central America and South America. 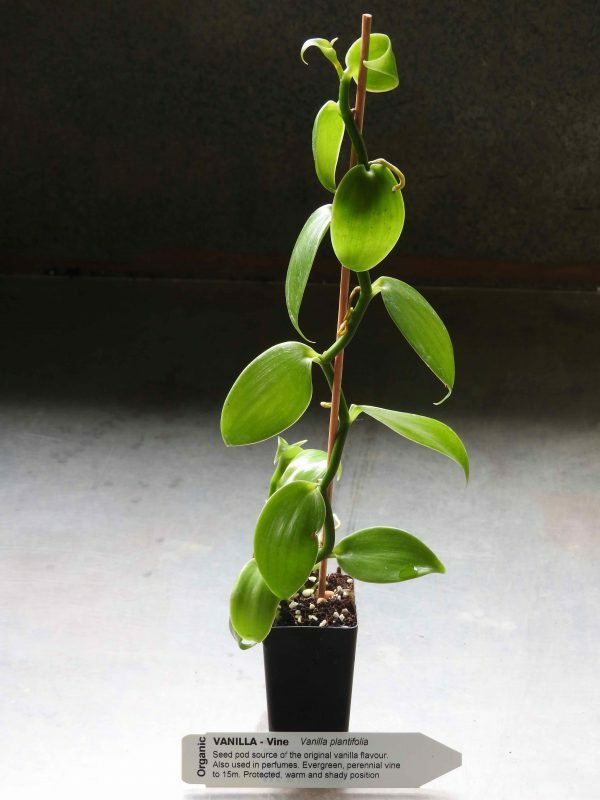 Vanilla plant refers well composted, free draining soils in a protected, shaded position – likes early morning sun. Clusters of yellow-green orchid flowers. Frost tender. An evergreen perennial vine growing to a length of 15m. Vanilla plant can be grown in most coastal areas of Australia, however additional protection in winter may be required in southern and inland areas. The cultivation range would be similar to Pandan plant. Be the first to review “Vanilla, plant” Click here to cancel reply.